Rebecca was born and raised in Muskegon. 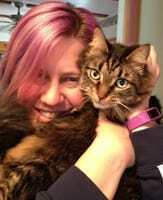 She began working as a receptionist at Clarke Animal Hosptital in 2003. In 2006 she was promoted to Hospital Manager at Clarke, and had the joy at adding Glenpark Animal Hospital in 2012. She has 4 cats (Silvey, Toby, Finn, and Phoenix) at home who enjoy bird watching in their spare time. In her spare time Rebecca enjoys reading, hiking, traveling, and working in her flowerbeds. Amy was born and raised in the Muskegon Area. She graduated from Michigan State University in 1998 with a Bachelors of Science degree in Zoology with an emphasis in animal behavior and neurology. She started working at Clarke in the fall of 1998 and has worked in all areas of the hospital. Amy is married with 2 children – a boy and girl. The family shares their home with 3 dogs – Conrad the Treeing Walker Coonhound, Skye the Australian Shepard, and Baylee the mixed breed, 1 cat named Coali, and a Guinea Pig named Trey. 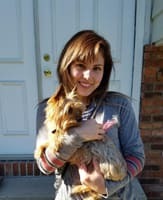 Jade interned at Clarke while she finished up her degree in Associates of Applied Science degree in Veterinary Technology, upon graduating in June 2015 she was hired as a full-time LVT. Jade enjoys spending time with her husband Josh and her young daughter Kylie. They have 2 dogs Zeus (left) and Jackson (right), 2 rats named Daisy and Baby, and a parakeet named Cricket. In her free time Jade enjoys golfing, camping, and going to the beach. 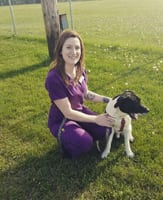 Sindle attended Baker College of Muskegon, she completed her externship at Clarke, and upon graduating from the Veterinary Technician program in 2017, was hired as a LVT. She has an interest in physical rehabilitation and exotics (thanks to her guinea pig Nona). She suffers from OHPD, Obsessive Harry Potter Disorder, and loves to curl up with her dogs and read the books or watch the movies. She can also be seen outside playing with her dogs Ladybird and Rueger, kayaking, grilling with family, or relaxing at the beach. She is very excited to be working at Clarke and Glenpark and can’t wait to learn from the knowledgeable and experienced staff. Tiffany was born and raised in the Muskegon area. After attending Ferris State University she transferred to Baker where she graduated for the Licensed Veterinary Technician program in 2006. She briefly worked in Grand Rapids before coming to Clarke in 2006. She is married and has two young boys. Tiffany enjoys spending time with her friends and family, and does what she can to help out the local rescues. She shares her home with two doggie furkids, Buddy and Mia. Katie was born and raised in the Fruitport/Muskegon area. She is married with 2 children. Katie started at Clarke in August of 2017 as a receptionist and has loved it ever since. She adores cats, currently has 2 dogs with a Pug puppy on the way. When she isn’t working, she loves to spend time with her children, traveling to her oldest daughter’s soccer games (GO SAILORS) and relaxing at home. Lejaye currently attends Baker College to become a veterinarian technician. She has two dogs named Lola and Frankie. In her free time, she loves spending time with her family and also enjoys going on hikes and practicing photography with her boyfriend Sam. Marilyn has enjoyed working for Clarke Animal Hospital for over 22 years. Her family consist of her husband, five children, three grandchildren, and seven furry family members. She has two dogs, a Jack Russell Terrier and a Chihuahua and five cats. All but one were rescues. She enjoys gardening, cooking, crafts, reading and spending time with her family. Penny was born and raised in the Muskegon area. She is married with 2 children, 3 step children, and 5 grandchildren. Penny started at Clarke in 2012 as a receptionist and now also helps out as a veterinary assistant. She loves her job and all the wonderful staff. Penny has a household full of animals which include 3 dogs and 2 cats. In her off time she enjoys working out, running, watching football (huge Packer's fan), shopping, watching her daughter cheer, movies and being outdoors. Toni was born and raised in Muskegon, MI. She started working at Clarke Animal Hospital in June of 2015. She is currently attending Baker College of Muskegon to become a Veterinary Technician. Toni has two dogs, Conner and Blaze. When she is not working, she enjoys spending time with her family and friends, baking, fishing, and going to the beach. Toni loves her job and all the wonderful staff she gets to work with! She also loves getting to meet the wonderful clients & patients at Clarke Animal Hospital. I was born in Chesapeake Bay, Virginia but my family moved back to Michigan shortly after. My husband and I got married June of 2017, we have 2 beautiful children, Brooklynn and Colton, 3 fur babies Copper, Skyy, and Ryder, and a bunny Alakazam. I have always had a passion for animals, as a child I would always bring home stray animals and volunteer at the local animal shelter. I grew up participating in 4H, showing horses, pigs, goats, rabbits, and dogs at the Newyago County Fair. Being a part of the Clarke team and getting to work around animals every day has been a dream come true. I plan on furthering my education and work towards becoming a Veterinary Technician. When I am not working I enjoy traveling, camping, fishing, and just relaxing with my family.